While media tablets aren’t expected to bring an end to the notebook market, they are contributing to slowing growth in the segment. Mainly driven by Apple Inc.’s iPad, the media tablet market is set to boom in the coming years, with worldwide shipments rising at a compound annual growth rate (CAGR) more than 42 percent from 2011 to 2015. 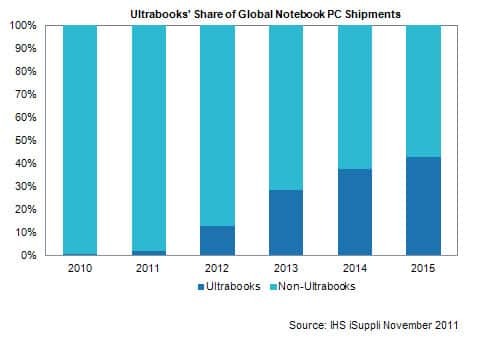 Meanwhile, the notebook market has entered a stage of maturity, with shipments increasing at a CAGR of only 10 percent during the same period. Ultrabooks are defined as notebooks that are extremely light and thin, at less than 0.8 inches in thickness. While ultrabooks employ a full PC operating system like Microsoft Windows, they also add features now commonly found in media tablets, such as instant-on activation, always-connected wireless links, solid state drives and battery lives that are longer than eight hours on a single charge. Ultrabooks are targeted to be priced at less than $1,000, although most of the early models are more expensive. Future ultrabooks are expected to employ convertible form factors and touch screens, allowing owners to use these devices either as notebooks or tablets, depending on their needs. The initial target market for ultrabooks will be consumers. However, PC makers also are likely to develop models aimed at corporate users. While multiple companies are pushing ultrabooks, the strongest supporter is PC microprocessor giant Intel Corp., which made the announcement at Computex Taipei 2011 and discussed its concept of the platform at its Intel Developer Forum (IDF) in September. Intel’s vision of the ultrabook includes the use of the company’s second-generation Core microprocessors, along with Microsoft’s upcoming Windows 8 operating system. The company said the first Intel-style Ultrabooks are expected to be shipping in time for the Christmas sales season this year, and some PC original equipment manufacturers—including Acer and Asustek—already are selling the products. Intel at IDF also previewed the next generation of ultrabooks set for release in 2012 that will be based on the company’s third-generation Core microprocessor line, codenamed Ivy Bridge. While Intel’s ultrabook push could be viewed as a reaction to the rise of media tablets, the effort could set the stage for the revitalization of the electronics supply chain. Jelinek predicted this event could bring to an end the current slowdown in the semiconductor and electronics manufacturing industries. One potential significant growth area would be in flash memory. The transition from the hard disk drives commonly used in notebooks to the solid state drives employed in ultrabooks will increase unit demand for flash memory while stabilizing chip average selling prices. The benefits would not just be confined to chip manufacturers alone but also positively impact other supply chain participants, such as battery suppliers and electronics contract manufacturers.